5x A9/A10 cruiser tanks. Each sprue also includes options to build variant desert sand skirts, A9 close support, A10 MKIIA, A10 MIIA close support and contains tank commanders. 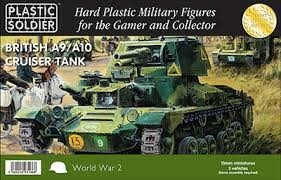 15mm sized models, plastic kits.